Crescent® Cotton Rag and Crescent® Select. Both grades meet the Fine Art Care and Treatment (FACT) standards and the Fine Art Trade Guild (FATG) museum conservation standards. • Comes in White or Ivory with a white core. • Buffered with calcium carbonate to an alkaline reserve of 3-5%. Mix 'n' Match pricing allowed for the same grade, same-sized colors. MINIMUM 5 SAME-SIZED COLORS. Discounted price will be reflected on the final invoice sent with your order. • Comes in White or Ivory, solid color throughout. Crescent® 100% Cotton Rag 8 x 10" x 2-Ply (.030" thick). 8 x 10" x 2-Ply .030" thick. Acid-free, lignin-free, buffered, speck-free, impurity free. Use for mounting 4 x 5", 4 x 6", 5 x 7" images. Click on drop-down to choose a color. Crescent® 100% Cotton Rag 11 x 14", 2-Ply (.030" thick). 11 x 14" x 2-Ply .030" thick. Use for mounting 5 x 7" or 8 x 10" images. Crescent® 100% Cotton Rag 12 x 16", 2-Ply (.030" thick). 12 x 16" x 2-Ply .030" thick. Use for mounting 8 x 12", 8-1/2 x 11", A4, or 9 x 12" images. Crescent® 100% Cotton Rag 16 x 20", 2-Ply (.030" thick). 16 x 20" x 2-Ply .030" thick. Use for mounting 8 x 10", 11 x 14" images. Crescent® 100% Cotton Rag 18 x 24", 2-Ply (.030" thick). 18 x 24" x 2-Ply .030" thick. Use for mounting 11 x 17", 12 x 18", 13 x 19" images. Crescent® 100% Cotton Rag 20 x 24", 2-Ply (.030" thick). 20 x 24" x 2-Ply .030" thick. Use for mounting 16 x 20", 11 x 14", 14 x 17", or 14 x 18" images. Crescent® 100% Cotton Rag 24 x 30", 2-Ply (.030" thick). 24 x 30" x 2-Ply .030" thick. Use for mounting 18 x 24", 20 x 24" images. Crescent® 100% Cotton Rag 30 x 40", 2-Ply (.030" thick). 30 x 40" x 2-Ply .030" thick. Use for mounting photos and prints. Crescent® 100% Cotton Rag 32 x 40", 2-Ply (.030" thick). 32 x 40" x 2-Ply .030" thick. Crescent® 100% Cotton Rag 8 x 10" x 4-Ply (.060" thick). 8 x 10" x 4-Ply .060" thick. Buffered, Acid-free, lignin-free, speck-free, impurity free. Crescent® 100% Cotton Rag 11 x 14", 4-Ply (.060" thick). 11 x 14" x 4-Ply .060" thick. Use for mounting 5 x 7"or 8 x 10" images. Crescent® 100% Cotton Rag 12 x 16", 4-Ply (.060" thick). 12 x 16" x 4-Ply .060" thick. Crescent® 100% Cotton Rag 16 x 20", 4-Ply (.060" thick). 16 x 20" x 4-Ply .060" thick. Crescent® 100% Cotton Rag 18 x 24", 4-Ply (.060" thick). 18 x 24" x 4-Ply .060" thick. Crescent® 100% Cotton Rag 20 x 24", 4-Ply (.060" thick). 20 x 24" x 4-Ply .060" thick. Crescent® 100% Cotton Rag 24 x 30", 4-Ply (.060" thick). 24 x 30" x 4-Ply .060" thick. Crescent® 100% Cotton Rag 30 x 40", 4-Ply (.060" thick). 30 x 40" x 4-Ply .060" thick. Crescent® 100% Cotton Rag 32 x 40", 4-Ply (.060" thick). 32 x 40" x 4-Ply .060" thick. Crescent® Select 100% pure Alpha Cellulose. 8 x 10" 4-Ply (.060" thick). 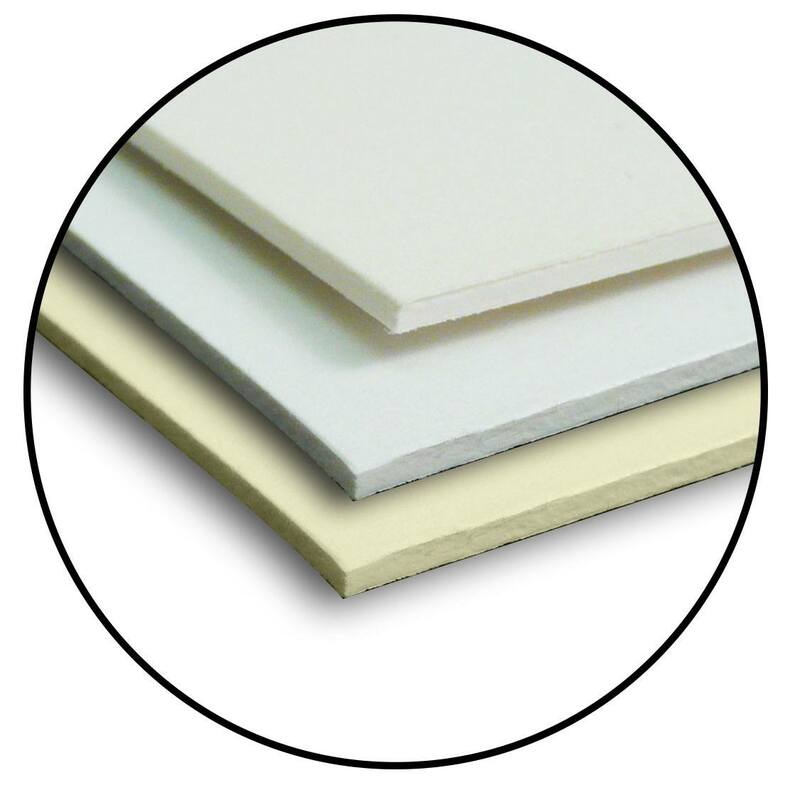 Conservation Grade Mounting Board - Crescent® Select. 100% Pure Alpha Cellulose - White or Ivory. 11 x 14" 4-Ply (.060" thick). Use for mounting 5 x 7", 8 x 10" images.